BAGHDAD • Iraqi forces have cleared areas around Fallujah after launching an assault to retake the city, tightening their siege on Islamic State in Iraq and Syria (ISIS) fighters but also raising fears for the civilians trapped inside. Fallujah has been held by ISIS for more than two years - longer than any other city it has held in Iraq or Syria. With the militants surrounded and outnumbered, the recapture of their iconic bastion looks inevitable, especially after ISIS suffered a string of losses in recent months. But even a diminished ISIS is still dangerous, with the group striking back with a wave of bomb attacks, including a series of blasts that left more than 160 dead in the Syrian regime's coastal strongholds on Monday. Iraqi Prime Minister Haider al-Abadi declared the start of the operation to retake Fallujah on Monday, and less than a day into the battle, Iraqi forces had secured the nearby town of Garma. That cut off ISIS fighters in Fallujah from one of their last support areas and paved the way for more advances towards the city, which lies 50km west of Baghdad. "Federal forces advanced towards the east of Fallujah early today from three directions," police Lieutenant-General Raed Shakir Jawdat said. The Hashed al-Shaabi umbrella paramilitary organisation, dominated by Iran-backed Shi'ite militias that are heavily involved in the operation, said ground was also gained south of Fallujah. With forces converging on the city, concern deepened that the tens of thousands of civilians believed to still be inside have nowhere to go. The Norwegian Refugee Council (NRC) estimated the number at 50,000 and called for efforts to get them out. "Families who have been suffering food and medical shortages over the last months now risk being caught in the crossfire, and it is absolutely vital that they are granted safe routes out of there so that we can assist them," NRC country director Nasr Muflahi said in a statement. He said that only 80 families appeared to have been able to flee the city in the hours before the fighting began, and none since. A Fallujah resident reached by telephone said there was heavy shelling on the northern edge of the city yesterday. "Daesh is still imposing a curfew, preventing people from coming out on the street," said the man, who gave his name as Abu Mohammed al-Dulaimi. Daesh is the Arabic acronym for ISIS. Any ground battle to liberate Fallujah will likely be long and bloody. 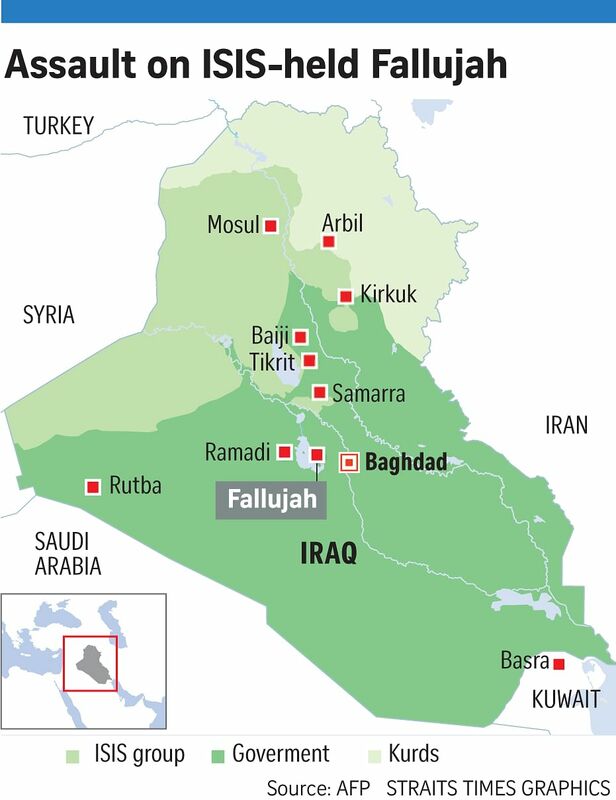 Fallujah has long been a stronghold of Sunni extremism. The US military fought two fierce battles for the city in 2004. ISIS claimed responsibility for the unprecedented string of bombings in coastal Syrian towns that are home to President Bashar al- Assad's Alawite minority. The bombings in Jableh and Tartus on Monday killed at least 161 people, said the Syrian Observatory for Human Rights monitoring group.